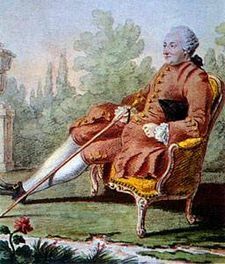 Paul-Henri Thiry, Baron d'Holbach (1723 - 1789), was an early advocate of atheism in Europe. Conservapedia has initiated a campaign to expand its number of articles relating to atheism. Editors are encouraged to create articles on the subjects below. The objective is to provide the public with a greater understanding of the topic of atheism in terms of its history, ideology, promulgation, effects on society and its relationship to counter atheism movements. Conservapedia also encourages individuals to spread awareness about the Conservapedia Atheism Project, as we are seeking to expand our editor base and greatly expand our readership among the general public concerning the general subject area of atheism. The Conservapedia Atheism Project and related events spurred the creation/expansion of these articles: Definition of atheism, Atheism 3.0, Soviet atheism and Atheism symbols. The Conservapedia Atheism Project has definitely been a success. Conservapedia has articles on atheism that consistently rack up a significant amount of views month after month. On the other hand, the atheist movement is in decline (see: Decline of the atheist movement). Please help keep the momentum going. Please create some high quality articles on atheism at Conservapedia. Below is a list of articles that Conservapedia wishes to have added to our online encyclopedia along with some helpful guidelines. In addition, please feel free to create topically relevant articles related to atheism at Conservapedia that you believe would be important additions to our growing collection of articles on the atheism and Christianity vs. atheism issues. Note to individuals or teams of individuals creating articles: Where appropriate, please try to make the articles or essays at least 400-1000 words in length rather than making stubs. There is a helpful tool located HERE for web writers that indicates how many words are on a web page. Please cite your sources for articles via footnotes (see: Conservapedia:Footnotes - technical help). If you want to easily find some initial sources written from a Christian perspective on various topics related to atheism, one method you can use is to use the Christian search engine Seek Find. In addition, it is important that the articles be original and not created by merely cutting and pasting content from other websites. Please feel free to add any other article suggestions or expand the articles below. As articles are completed, they are deleted from the lists below. from Tim LaHaye, The Battle for the Family, 1982. Attention! Conservapedia wishes to increase public awareness of its Atheism Project to counter many atheism websites targeting young people. Are you a member of a site like Facebook, Twitter, Google Plus, Pinterest, Myspace, myIchthus, MyChurch or other social networking websites? Spread the word about the Conservapedia Atheism Project. Please tell your blogger friends and bloggers about the Conservapedia Atheism Project. Email everyone in your contacts and tell them about them about the Conservapedia Atheism Project so they can help us do something to counter atheists targeting young people with their false and morally bankrupt ideology. Are you on a Christian or conservative email list? Please forward a message to your fellow subscribers inviting them to take part in this exciting project. Are you active on YouTube, Tangle, Vimeo, or other video sharing websites? Create a video about the Conservapedia Atheism Project. Essay: Why does Conservapedia have so many atheism articles?